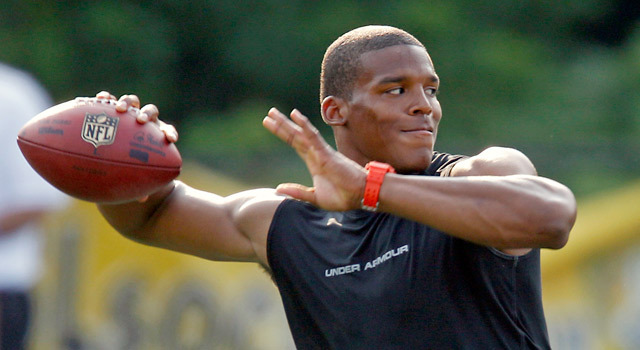 Published: June 17, 2011 at 03:46 p.m.
Cam Newton might line up against three 2010 NFC playoff teams in the first five games of 2011. Matt Ryan, Matthew Stafford, Mark Sanchez, Sam Bradford and Joe Flacco -- quarterbacks with three years or less experience -- all started the first games of their rookie seasons. Of the six quarterbacks taken in the first two rounds of the 2011 draft, four could open the season under center. Jacksonville's Blaine Gabbert and San Francisco's Colin Kaepernick are expected to back up veterans David Garrard and Alex Smith, respectively. First five games: at Arizona, Green Bay, Jacksonville, at Chicago, New Orleans. The good: Opening at Arizona, rather than starting his career at home, will take the edge off the No. 1 overall selection. He'll also be facing a team that might not put up a lot of points and shouldn't force him into a situation where he has to throw much to keep up -- or allow the Cardinals to get blitz happy. That can't be said about the remaining NFC teams on this slate. Welcome to the NFL moment: In Week 2 vs. Green Bay, defensive coordinator Dom Capers could overwhelm Newton with a variety of schemes, blitzes and pre-snap looks. Green Bay also could jump out to a quick lead and make the Panthers air it out, which means Clay Matthews and Co. would be turned loose on Newton. » Out with old, in with new in Cincy? The good: Although the first two games are in hostile environments, Cincinnati should be able to run on both teams and allow Dalton to throw only when needed. All but San Francisco rated among the worst defenses in the NFL last season. This isn't an awful baptism for a rookie QB and if the Bengals can generate some positive momentum before getting into the guts of their schedule, they could surprise. Welcome to the NFL moment: Playing at Denver is never easy and if DE Elvis Dumervil and rookie OLB Von Miller are set on the same side, there could be some protection issues. CB Champ Bailey also isn't the type of corner you want to face with such a young group of receivers, including first-rounder A.J. Green. The good: Jacksonville, Denver and Cleveland are suspect on defense and there should be some running room against the non-AFC North opponents. This isn't the most grueling lineup to start against, but the trap doors are very dangerous -- and obvious. Welcome to the NFL moment: It won't take long with the Ravens coming to Nashville in Week 2. Baltimore isn't going to give much ground for Chris Johnson to run and it plays well on the edges to prevent a lot of effective rollout plays, which could work against the athletic Locker. Locker will get to know Haloti Ngata, Terrell Suggs, Ray Lewis and Ed Reed very quickly. The good: These are teams in which running back Adrian Peterson can be highly productive, setting up the play-action pass. Other than the Chargers, these aren't necessarily high-powered offenses so the Vikings can stay close. It could then be on Ponder to make a play in crunch time. Welcome to the NFL moment: Week 1 against a very good Chargers defense. Linebacker Shaun Phillips is relentless and there are no real weaknesses. Ponder has to hope the defense doesn't get worked by Philip Rivers and company. If so, he'll be asked to do a lot against a unit that doesn't play around.